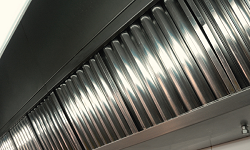 We provide kitchen exhaust maintenance services to ensure you kitchen hood and exhaust venting systems are clean and safe. One third of commercial restaurant fires are grease related. The grease also acts as a bacteria breeding ground in vents and other areas. Our cleaning methods are superior in removing grease and bacteria. We use a combination of caustic chemicals as well as hot water pressure washing, finished off with a hood polish for a Profeesional and clean look. 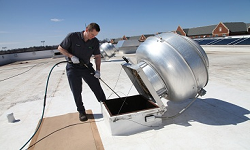 Along with our hood and exhast vent cleaning services, we will provide a digital inspection report with pictures outlining the maintnenace and cleaning services we provide. This is proof of your due dilligence, as Fire and Health Officials generally follow the Alberta Fire Code Guidlines. 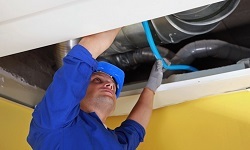 1) Hoods, ducts and filters subject to accumulations of combustible deposits shall be inspected at intervals not greater than 7 days, and shall be cleaned if the accumulation of such deposits creates a fire hazard. 1) Except as provided in 1.1.2.3., commercial cooking equipment exhaust and fire protection systems shall be designed and installed in conformance with the Alberta Building Code. 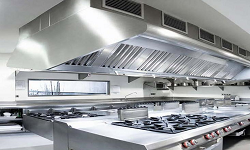 2) Except as provided in 1.1.2.3. and Sentences (3) to (5), the use, inspection and maintenance of commercial cooking equipment exhaust and fire protection systems shall be in conformance with NFPA 96, "Ventilation Control and Fire Protection of Commercial Cooking Equipment."